Walnut grove is a former equestrian estate, where nine walnut trees, Čili the home kitten and an experienced team specialised in creating experiences of all sorts at a true vintage-eco-chic location are all awaiting you. The location is also suitable for winter events, as they have a heated Kozolec (hayrack) and a partly heated barn. The Orehov gaj group are specialists in tourism experiences and even have their own experiential engineering unit. Walnut grove is part of the Walnut grove group, which includes a team building agency, the Dragon Temple escape room and the Martin Krpan Institute, through which they develop their tourism experience. Walnut grove is a unique event and educational space, located in a quiet spot near the village of Jarše in Ljubljana and just 2km from BTC City, which is one of Europe’s largest shopping centres. On a property of 3ha they have more than 500m2 of permanently covered areas (of which 100m2 caters for all seasons), 300 parking spaces, various sports grounds, large grassy surfaces and a beautiful Walnut garden. There are two separately arranged units on the estate – the central estate with the “Skedenj” and “Kozolec” buildings, and “Kobilca”, a smaller space with a roof for 50 persons. Walnut grove is suitable for those looking for a unique location that exudes familiarity, authenticity and evokes a sense of relaxation. 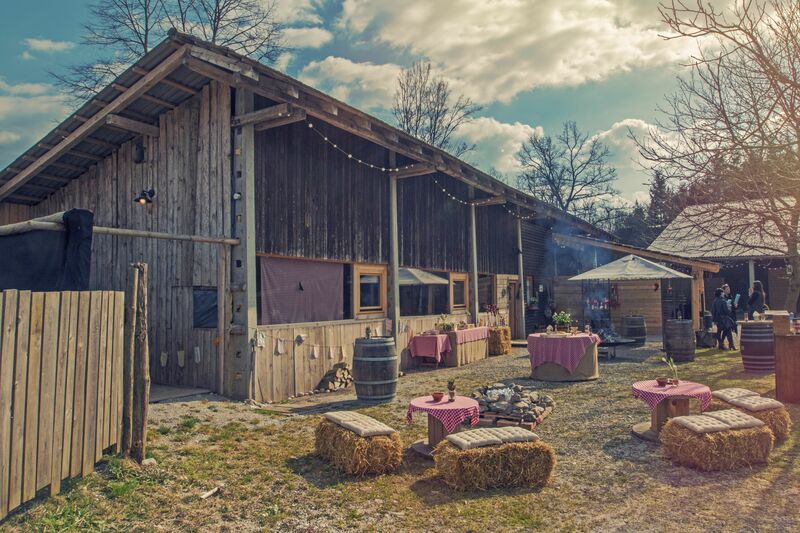 The venue is a suitable choice for those who want to carry out an event with charisma that the participants will long remember for the beautiful vintage and eco-chic ambience, the excellent food and the wonderful hospitality of the team. The venue is designed for hosting all kinds of business events, but it is also suitable for organising various private events too, such as weddings, anniversaries or birthday celebrations. Due to its spaciousness and the possibility of renting adjacent plots, the property is also an excellent location for carrying out slightly different conferences or even work meetings in natural surroundings, as well as internal and promotional events for companies or picnics ‘with a story’. Intimate events for small groups can also be arranged, making use of several different areas, as well as larger picnics and boutiques for up to 1,000 people. They venue also oversees about 200 business events annually, from working meetings and conferences to press and promotional events, as well as events organised by companies for employees or their business partners. Among business clients they are known as a “one-stop-shop”, as with just one phone call the venue, catering services and the organisation of experience incentive programmes can all be arranged. In Walnut grove they are very proud of their own professional catering team, which offers a level of excellence to all of the participants along with the ultimate culinary experience at events. Their culinary specialties are set apart by using reliable, fresh, local ingredients brought together at innovative culinary receptions with fine decoration and, above all, through a love of the classical grill, the black boiler, Bosnian sauce and baking in a live open fire. In addition to show cooking, which is their bedrock, they regularly perform culinary incentive programmes and interactive culinary slots, where guests are included to an extent they feel comfortable with. And not only that – they also have their own catering which goes by the name of “Potujoča kuhna” (Traveling kitchen), with which the spirit of the Walnut grove can be taken to other locations. Their Team Building Lab home agency has a wide range of animation, adventure and team building programmes that are also suitable for incentive groups. For many programmes, they are not bound to the Walnut grove location, but can be carried out at many other different locations across Slovenia. As part of the incentive groups they aim to present Slovenian local cuisine and the country itself in the best possible way. Among all of the programmes that are of particular interest to foreign guests, we should highlight the 100% Slovenian programme, which is a kind of mixture of Slovenian dinner and stand-up roast, in which they present some lesser known facts about the country.